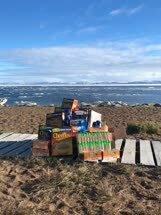 Niqinik Nuatsivik Nunavut Food Bank � 28 June 2018 � Thank you Khalsa Aid Canada for your donation and support! 1 Comment 10Niqinik Nuatsivik Nunavut Food Bank and 9 others Comments Khalsa Aid Canada Khalsa Aid Canada Thanks so much to your team too. We look forward to this being the beginning of a great relationship!